Would you enjoy a tool that would keep you accountable for the New Year? 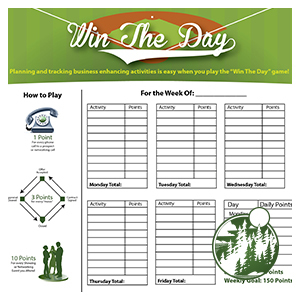 Try out our “Win The Day” worksheet to help you establish both daily and weekly goals. You can “win the day” with a variety of tasks ranging from one point for every phone call to a prospect, to ten points for every showing or networking event you attend. to obtain the full worksheet and start challenging yourself today.